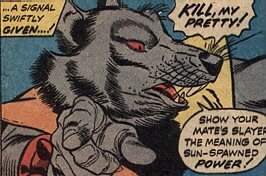 Powers: None really, other than whatever the natural powers of a rat are. He carried a giant mace that he never used, and had a grav belt, which helped slow his fall from great heights. 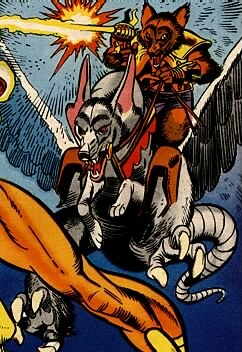 Physical Description: Rhodan is a three foot tall humanoid rat. His tail is as long as he is tall. History: (Marvel Premiere#2) - The Man-Beat had determined that Warlock had crashed into Southern California, and decided to dispatch an assassin to kill him once and for all. 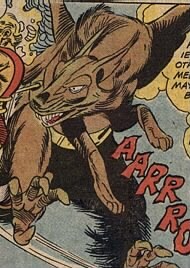 His aide Kohbra had anticipated this request, and sent for Rhodan, master of the Hounds of Helios! Rhodan agreed to bring back Warlock's head, "or another identifiable portion of his gleaming anatomy!". That kinda creeps me out. He climbed into his chariot pulled by the hounds of Helios, and headed for southern California. Warlock had awakened in Southern California after being teleported to Counter-Earth by the High Evolutionary, and met and was cared for by his spoiled, bratty teenage groupies. Their fathers, (one is a colonel, one is a CEO, one is a Congressman - how's that for obvious in representing the 'establishment') had hired a private investigator to locate them, since they ran away a few days ago. He led the fathers to the shack where they were hiding along with Warlock. Just as the fathers were about to force the kids to come with them, one of the Hounds of Helios attacked! 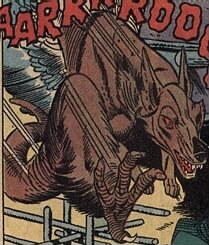 Warlock, like "a four-limbed arrow", hurled himself at the snarling Hound, knocking it to the ground and strangling it, eventually snapping its neck-- though Warlock did feel bad about it. He flew up to find Rhodan and the other Hound hovering far above. He used the Soul Gem on the remaining Hound, turning it into "it's true form of random solar impulses". Rhodan and his chariot fell to the ground, no longer having any Hounds to keep them afloat. Rhodan recovered and ran into a barn. Warlock followed. A "terrible scream" (SQUEEEEEEE!!) was heard. A few moments later, Warlock walked out alone. Warlock then does some kind of weird thing where he gets the fathers to look into his eyes, which become the "eyes of a soldier, before a grenade blinds him", eyes of poor children in war-torn countries, etc. This convinces them to let the kids alone so they can form their hippie commune-thingy. As they were leaving, Ellie asked what became of the thing in the barn. Adam said, "I do not kill, Ellie. I but made him once again what he always truly was!" Back in the barn, a cat triumphantly stalked away with a freshly-killed rat in its jaws. Comments: Created by Roy Thomas and Gil Kane. Though this seems to be a pretty standard fate for one the High Evolutionary's New-Men, I always love it when one of them gets reverted to its natural, un-evolved form and is either a) immeadiately killed by something higher on the food chain, or b) stepped on. The picture at the top of the page is from the cover of Marvel Premiere#2. Either the colors weren't finalized yet, or someone reversed the color schemes later, because Rhodan should be colored grey, and the Hounds should be colored brown, not the other way around. 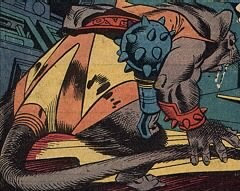 Any other rat-based marvel character - Vermin, Rodent, etc.